The Pan Lab studies population, health, and environment interactions to better understand synergies that contribute to sustainable development activities and improved global environmental health. Population, Health and Environment research uses an interdisciplinary approach to address the complex interactions between people, their health and their environment. As such, our collaborative team spans a range of expertise in quantitative, clinical, epidemiological, demographic and environmental sciences. In the northern Peruvian department of Loreto, malaria, spread by the Anopheles mosquito, has profound economic and health impacts. Malaria can cause extreme fever, vomiting, seizures and even death. The project’s goal is to create an early detection and warning system for malaria risk to prevent malaria outbreaks. 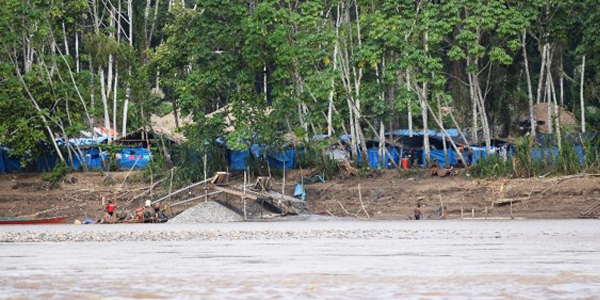 The Impacts on human health and the environment from resource extraction in the Amarakaeri Reserve study examines the health and environmental impacts occurring in communities near the Amarakaeri Reserve in the Madre de Dios region of Peru. Artisanal and small-scale gold mining is a growing sector of the global economy in more than 55 countries, many of which are in the developing world. The goal of our research along the river in MDD is to characterize the distribution and transport of Hg in the MDD environment and to determine how mining areas impact Hg concentrations in sediment and fish. Copyright © 2019 Pan Lab. Powered by WordPress. Theme: Spacious by ThemeGrill.